Where is the #hashtag advocacy for children’s mental health? Hashtags have really caught our attention at key moments. In 2014, #BringBackOurGirls drew the world’s attention to the kidnapping of 276 schoolgirls by the terrorist group Boko Haram. Sharing #JeSuisCharlie let everyone know that you were standing with others for freedom of speech after the massacre of 12 people at the Paris newspaper Charlie Hebdo. Started in response to the trial (and then acquittal) of George Zimmerman, #BlackLivesMatter compels us to focus on systemic racism and police brutality and is one of the most successful hashtags. In our sound-bite society, hashtags can capture a thought, unify a public conversation and link us together. But some are better than others. I am on the hunt for one that can springboard children’s mental health into everyone’s awareness. Sometimes, when families call with a heartbreaking story I think we should use #TreatmentWorksWhenYouCanGetIt or #FightingStigmaComesAfterFightingForCare. Then I realize we want to galvanize people, not sadden them. 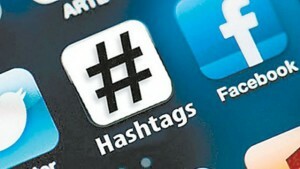 Hashtags became truly popular after first being dismissed as too nerdy. Chris Messina, who introduced hashtags in 2007, was told by Twitter that it was never going to catch on. His original idea was to organize tweets and messages into groups so that people interested in #mentalhealth, for instance, could sort through other people’s comments and see only the ones they were interested in. It’s hard to think today of how we would do any of this without hashtags. Using hashtags didn’t stop with grouping posts or tweets. Organizing messages is like library science. It helps us locate and gather information but then what? How do we move from informing to messages we can act on? Almost 3 billion people worldwide are on social media every day. Some of us get our news and updates online while some simply keep up with friends and relatives. Smart, effective hashtags have a unique ability to reach tens of thousands with a quick, clear message. Thousands have become hashtag activists, realizing early on that we can bring the public’s attention and empathy to a cause or circumstance that would have been unnoticed. Although this can create solidarity and visibility, there is debate about whether awareness can lead to significant change or move a sleeping giant. The jury is still out. What hashtag advocacy does is reframe the public conversation and perception. We have a chance to do this for children’s mental health. We have a chance to change how people see our families – the parents and siblings of children, youth and young adults with mental health challenges. To me, they are all unsung heroes, hanging in there, innovating on some days, sighing silently on others. When NFL player Ray Rice was caught on video camera punching his then-fiance, many wondered why she didn’t leave him. Stories from domestic abuse survivors poured out on social media under #WhyIStayed which changed the public’s view. Can we do the same for our families and create a hashtag that leads to an avalanche of stories? What about #WhyIWontGiveUp or #NotStoppingAnytimeSoon ? Because mental health issues show up as behavior, many young people are judged, isolated and belittled. It breaks our hearts as parents to see them hurt for things they cannot (yet) manage or control. I remember having many conversations with my son’s therapist about the constantly moving line between “cannot” and “will not” and then realizing so much fell into the “cannot” category. I fervently wished I could make the light go on for others too. Can we try out #ItsCantNotWont or #WhyIWontEngage ? Take a look at the top hashtags for mental health. Most are organized around diagnosis such as #anxiety or #ptsd. A few link to resources such as #suicideprevention. So far, organizing discussions by diagnosis and content hasn’t moved us forward. Messages have to be strong, compelling and clear. They also have to let others know that your issue should be a top priority. Does #mentalhealthmatters really make it matter more to anyone new? We need a hashtag for children’s mental health. Even better, we need a succession of them so that when one fades away another will replace it. We need a hashtag that will change the negative media images of young men with mental illness doing violent things into an I-get-it-now moment. One that will catch the attention and energy of Americans focused elsewhere. After all, 1 in 5 children experience a mental health issue each year, which means just about everyone knows a child or youth dealing with these issues.